Way out in the desert (seriously, it was a long, long walk), There are three desert sculptures, or art/home installations, built by German Artist, Hannsjörg Voth. From the town of Jorf, or sometimes El Jorf, it’s about a seven mile hike to the nearest piece. Then, it’s several miles between each of them. We thought we could do it all in one day, but we only managed to see one, the Golden Spiral, Goldene Spirale in German. Voth apparently lived in the Jorf area for a number of years and enjoyed the vast expanse of open desert that the area affords. Known for large installations that incorporate their environments, over a span of some 30 years, Voth set about creating three pieces each with a different theme. Each is unique and two actually incorporate livable homes inside, though to my knowledge, no one has ever lived there. Graphic designer, Marta Torres, created beautiful 3D exploded views of the structures. Stairway to Heaven (Himmelstreppe) was the first to be built, being finished in 1987. It’s a 16m high stairway with 52 steps leading to an entrance at the top. You then descend to the living accommodation. Voth then started on the Golden Spiral (Goldene Spirale) which he finished in 1997. 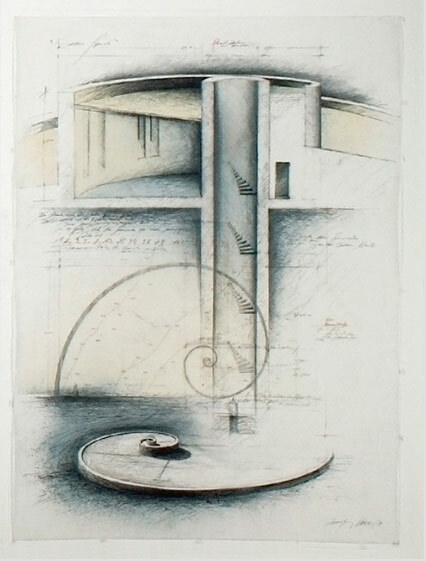 This is based on a shell design with steps in the middle leading down to living accommodation around an underground well. The City of Orion (Stadt des Orion) which was completed in 2003 doesn’t include accommodation, it’s a series of pise towers arranged in the pattern of the Orion constellation, the height of each tower reflecting its magnitude of brightness. Over Superbowl weekend, I convinced a group of like-minded Peace Corps volunteers and a couple of their Moroccan friends to join me on a trek into the desert to see the installations. To reach the area, it is necessary to cross a dry, but sandy, river bed. So, without a 4×4 and without permission to operate motor vehicles, we had to walk.. .and walk. . .and walk. Thankfully, we remembered to bring lunch and water. We could see the Stairway to Heaven far in the distance. It’s probably the closest, but we opted to begin with the furthest north, the Golden Spiral, then work our way south east toward the City of Orion, and finish with the Stairway to Heaven. 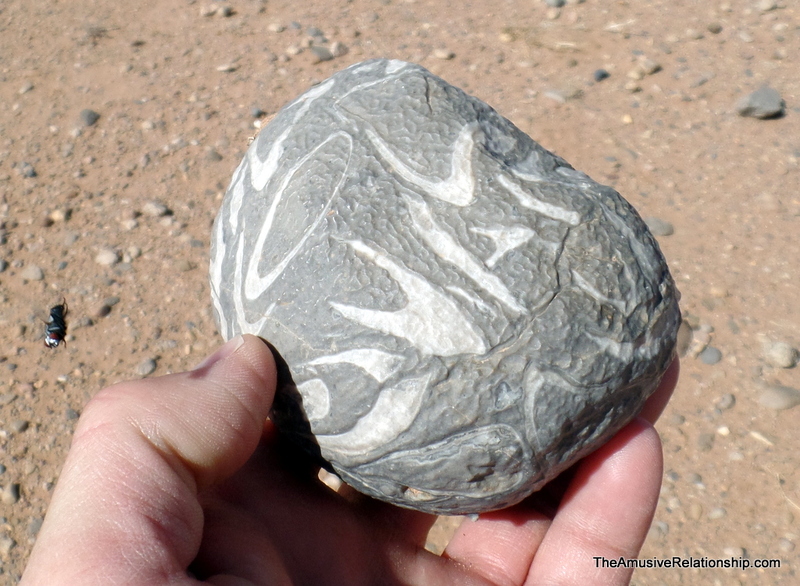 On the way, we discovered several amazing rocks and even a few fossils. 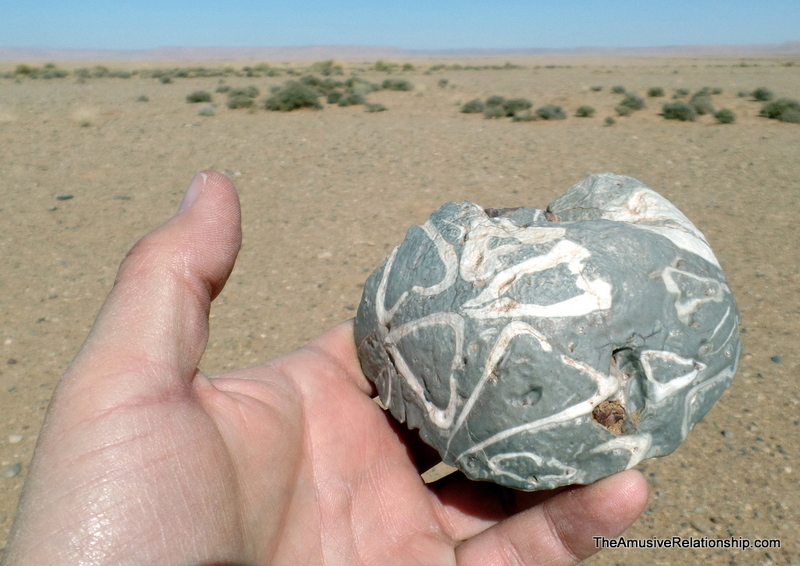 The area is an ancient sea bed, so fossils are everywhere. Based on the Fibonacci Sequence, nature’s perfect number, the Golden Spiral twists both out into the desert and down into the earth. Below the living quarters, stairs continue into the ground below. After several hours, we finally made it to the installation. It was amazing, albeit strange. Few people I’ve spoken to in the area even know they are there. On the main road, still miles away, there is a tourist stopover to see the underground qanats, but not even so much as a sign to show these pieces exist. By the time we arrived, we knew we would not have the time to see them all. Darkness would set in if we dawdled too long. We would need to wait to see the other two another time. I will keep you posted. 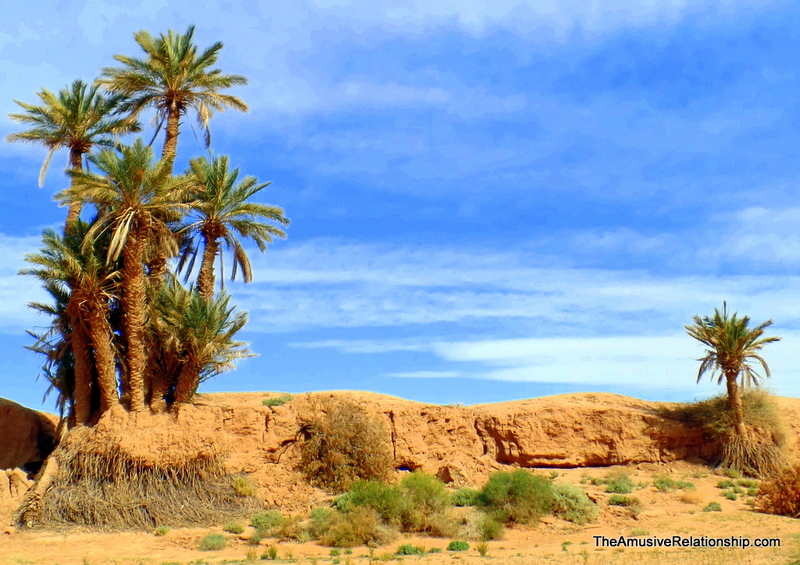 Below are some images of the Golden Spiral and our trek through the desert.